Lately, my son has been obsessed with shirts that have letters on them. He talks about the "wedders" on our shirts constantly. "Daddy has wedders. Sebastian has wedders. Mommy no wedders." And then he wants to match the letters on your shirt to the letters in his alphabet book. It's pretty darn adorable actually. About 85% of Seb's clothes are actually hand-me-downs from our neighbour (Thanks Amy!). So, since I've been able to outfit our little man with many great preloved clothes, I enjoy picking out a couple of extra pieces that I may have otherwise continued to drool over on Pinterest. 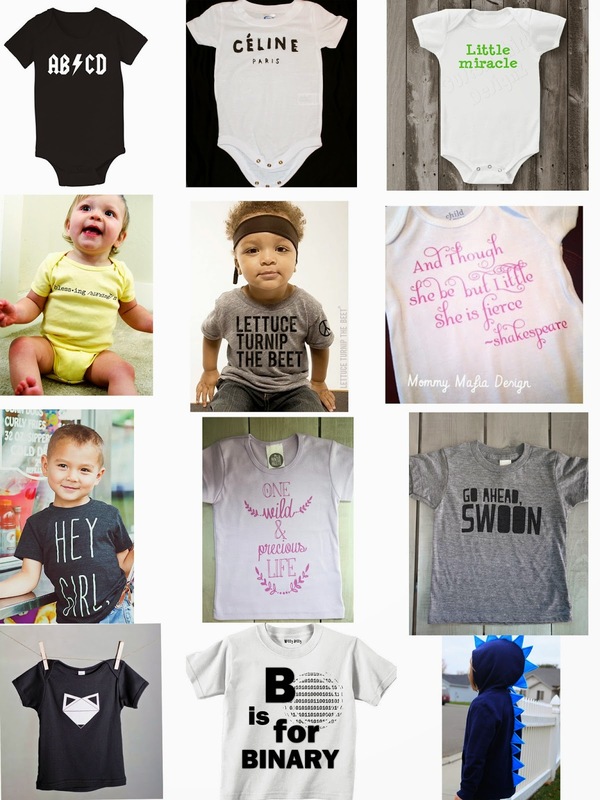 There is no shortage of adorable baby clothes out there. Especially if you're browsing on Etsy. I've rounded up a dozen of my favourites here. I ordered the Go Ahead, Swoon shirt for Seb. It has "wedders" so I hope he likes it. And I think the Dinosaur Spike hoodie is a great item to keep in mind for the fall. Which is your favourite?